Dealing with an arrest is difficult enough without having to worry about how to get the money together to pay bail. Luckily, you have options. A bail bondsman can take some of the stress off of your shoulders during a very hard time. Call ASAP Bail Bonds in Gwinnett, Cobb, and Barrow Counties for help. We are available 24/7, because we know that these things rarely occur at convenient times. 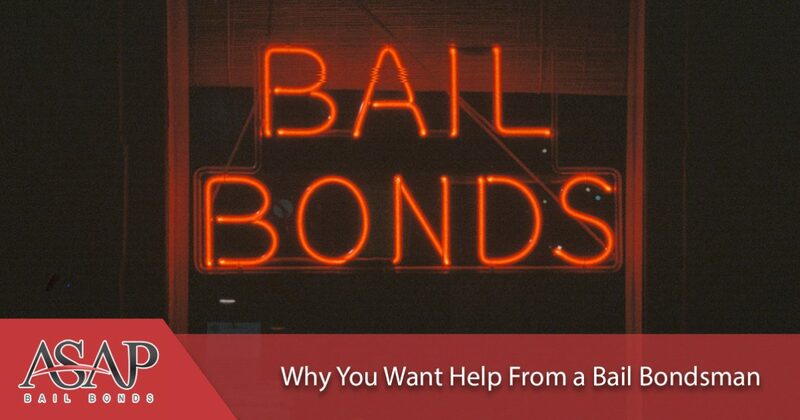 Our knowledge of the court system, our low premium costs, and our willingness to help you understand what is going on with your case sets us apart from other bail bonds companies out there. If you have never had to post bail for someone before, then let us tell you that it isn’t a process you want to learn about. The system moves quickly but if you aren’t prepared, you will become frustrated and no closer to getting the person you care about out of jail. 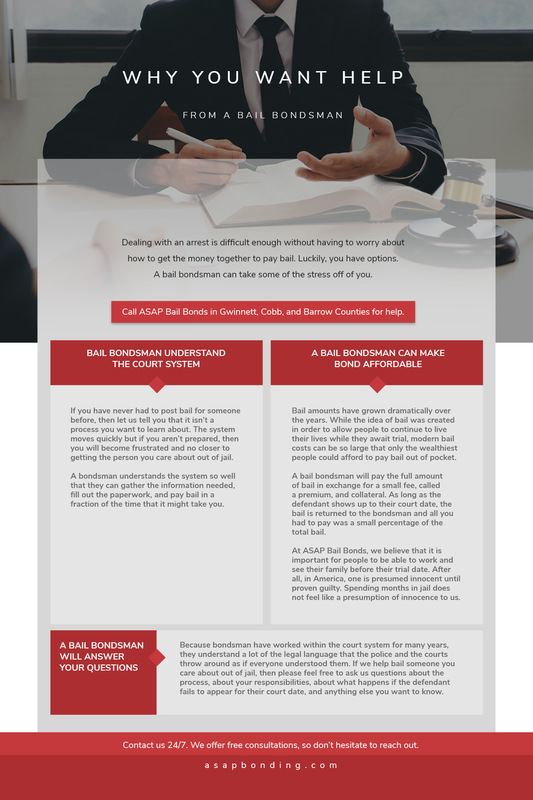 A bondsman understands the system so well that they can gather the information needed, fill out the paperwork, and pay bail in a fraction of the time that it might take you. Bail amounts have grown dramatically over the years. While the idea of bail was created in order to allow people to continue to live their lives while they await trial, modern bail costs can be so large that only the wealthiest people could afford to pay bail out of pocket. A bail bondsman will pay the full amount of bail in exchange for a small fee, called a premium, and collateral. As long as the defendant shows up to their court date, the bail is returned to the bondsman and all you had to pay was a small percentage of the total bail. Typically, the premium amount is around 10 percent of the overall bail cost. At ASAP Bail Bonds, we believe that it is important for people to be able to work and see their family before their trial date. After all, in America, one is presumed innocent until proven guilty. Spending months in jail does not feel like a presumption of innocence to us. Because bondsman have worked within the court system for many years, they understand a lot of the legal language that the police and the courts throw around as if everyone understood them. If we help bail someone you care about out of jail, then please feel free to ask us questions about the process, about your responsibilities, about what happens if the defendant fails to appear for their court date, and anything else you want to know. Contact us 24/7. We offer free consultations, so don’t hesitate to reach out. If you think that you may have an outstanding warrant, then we offer a free warrant search service that will let you know if, and where, there are warrants. 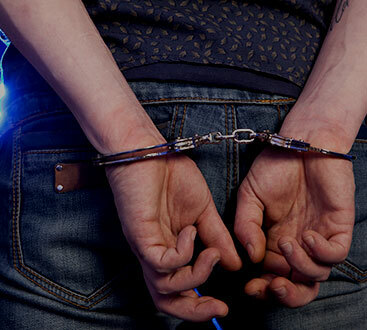 We can start the bail paperwork to bond you out as soon as possible, so there’s no reason not to contact us.